So in regards to my post title, the fabric I used to tie the bow around my neck is from my prom dress back from my senior year of high school (I went with my best guy friend). Since I'm pretty short I had to get the dress hemmed. The tailor who cut a couple of inches off gave me the remaining mesh fabric so I kept it around. It comes in handy every now and then and I love the color. It's actually my favorite color to wear. awww. I'm sorry you're sick! I'm like you. I don't let being sick ruin my plans and therefore, make the worst ill person ever. Like, I got my wisdom teeth out just last week, and the very day of it, I was outside running around. It's taking forever to recover. I love this dress! And you should include a picture of you from senior prom:) It would be fun to see! That color looks gorgeous! 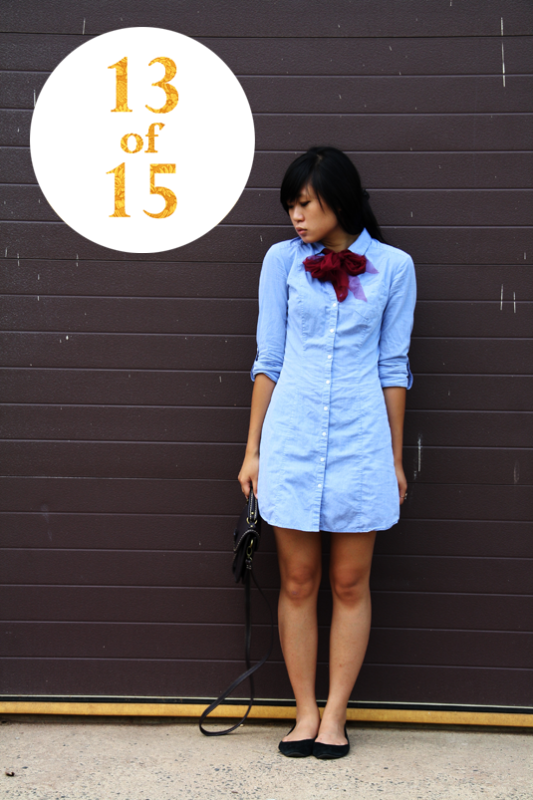 i love that chambray shirt dress! hope you get well soon! hopefully you feel better soon and goodluck on moving day! it's sad and exciting at the same time! anywayy,, prettyy lil bow ,, spicing up the looks !! that chambray shirt dress is totally so versatile!! Hope you feel better soon. I love the colour of your bow, one of my favourite colours to wear too. That ring is so cute as well. Ohhh that's cool how your bow is from your prom dress! :D It looks so cute on youuuu! I love your ring as well. <3 I hope you stop being sick, because being sick is no fun when you want to do things! This is such a cute outfit! I love what you did with the bow. What a great way to repurpose a piece that brings back good memories! I love it as a bow on the dress. So sorry you're not feeling well! I know how hard it is to slow down when you're sick, you'd rather just pretend you feel fine. Hope you're able to get the rest you need so that you can quickly be back at 100%! Sorry to hear you're not feeling well! That's always the worst - especially at the end of summer. But this bag is simply amazing! I think it's the stitching. and I love your bow! cute bow! I really love how made the left over fabric into a bow, definitely brings that dress to a whole new level! Oh and I have that purse in the tan color :) I would like it 100x more if it could fit my wallet..or my phone..or just something in general, haha! This outfit is so cute, Jen! I want that bag.. so simple but very pretty..
You are so adorable! I love the look! The quiet detail makes this outfit so charming. It's interesting, but not overwhelming. It also helps that you are beautiful. :] You are totally creative for using bits of your prom dress for a bow. My prom dress was actually a similar colour!! Oh boy, talking about this brings on a wave of nostalgia..
hahahahaha RELAX! Define that word for me, please. I really like how you wore the "scarf" - tucked under the collar like that. It is perfect with this dress! okay when i get to your place, you have to teach me how you tied that scarf! it's so clever of you to use scraps to create something beautiful! you are right the color is gorgeous! i love your bag! i remember eyeing it at UO but robert said something about it being impractical or something like that haha :) feel better dear <3 i hope moving in goes smoothly and you'll get to rest a bit! Adorable and that bag is tops! Awww, I hope you feel better now! You seriously need to take a break and take care of yourself. Glad to see you're still smiling! Love this vintage-y outfit! I love that chambray shirt on you, and the story behind your pretty "scarf" is lovely! It's such a nice color :) Haha you need to get some rest! Get well soon! 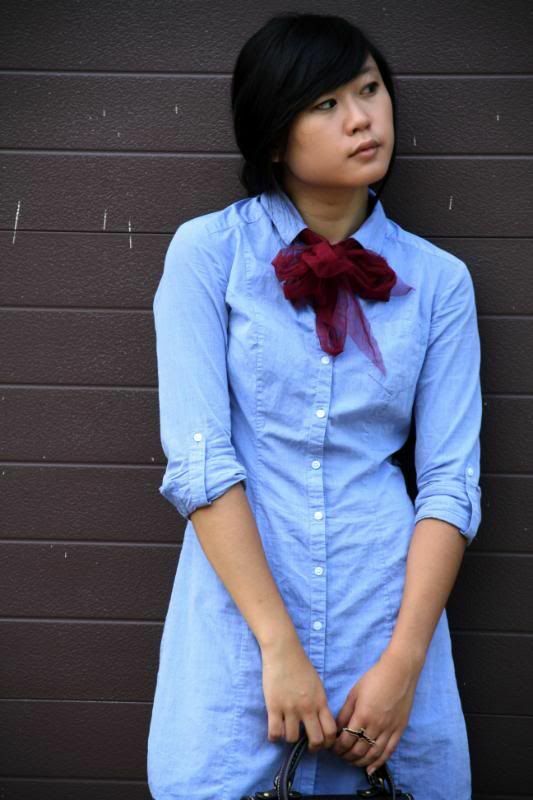 I love how you styled the shirt dress, the bow is a really nice touch. This outfit plus the bag = perfection. I'm just that way--I get sick, but I don't stop anything. I usually get sick right before a big, huge, and important event anyway--so I have no choice but to keep going! Still, I hope you get better soon! I love this H&M dress. I have one like it from Macy's that I posted eons ago! You are one of the few people I know who can work the really high neck/pussybow thing! Looks awesome... and a lovely story! Enter the mind of Serg Riva, the world's preeminent aquatic couturier. No one takes swimwear design as seriously and no one does it as well. Stitching together fashion and celebrity, Serg Riva navigates socialites, intellectuals, and the cultural cognoscenti in search of poetic design, artistic inspiration, trusted friendship, and ultimately-love. Sound interesting? Why not read the book? It's the worlds best-selling fictional fashion memoir about couture swimwear (OK, it’s actually the world’s only fictional fashion memoir about couture swimwear, but it’s still really good!). Find it on Amazon by following this link. Thanks for checking this out. Let me know if you're interested in writing a blog review, I'll happily send more materials. Glad you're feeling a little better... Hope you feel even better asap! That shirt dress is absolutely lovely. I need a nice one like this! That's so cute that you still wear your prom gown fabric! 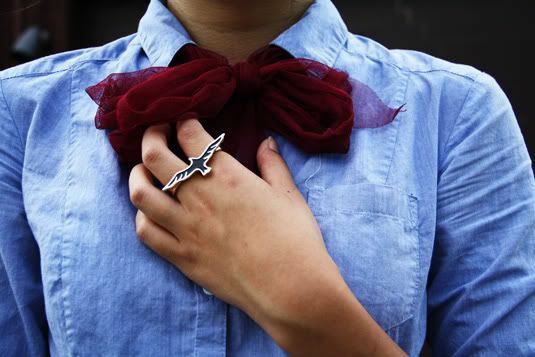 The color is really lovely, and the bird ring is too cute. now get some rest and start feeling better!! ahhh such adorable-ness! i'm behind on blog reading...! going to catch up now..
you are genius! the bow is so beautiful!! Get well soon. I can't believe how wonderful you look when you're ill. I would be in my pjs. This dress looks great with the bow - it takes it to a whole new level. So simple, so chic! I hope you get better really soon sweetie. Xoxo! Love this! My absolutely favorite.